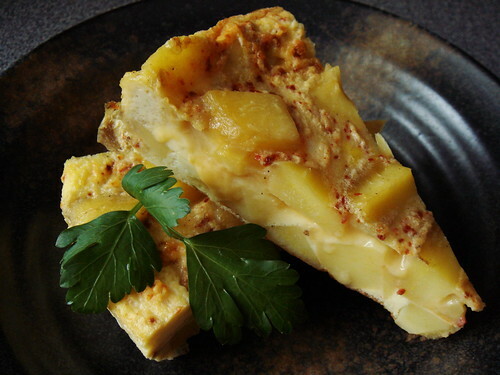 This week’s recipe for French Fridays with Dorie is Basque Potato Tortilla. A potato and egg omelette that can be enjoyed warm, room temperature, or cold? 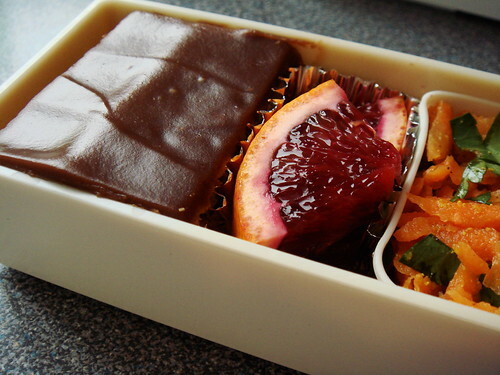 Isn’t that a bento mainstay I’ve been enjoying for years? 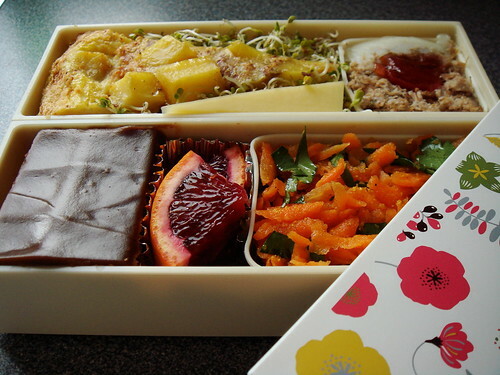 That’s the inspiration behind my bento with French flair. Let’s talk about the tortilla first. I used German butterball potatoes in my tortilla, a variety similar to Yukon gold. I followed the original recipe almost to the letter except for one very important substitution: duck fat. Duck fat and potatoes is a match made in culinary heaven and I seek every chance to incorporate it in my cooking. As you can imagine, there’s always a supply of rendered duck fat in my freezer. The savoury duck fat lends so much flavour to the tortilla the thought of ham or cheese didn’t even enter my mind until I re-read the Bonne Idée in the recipe days later. A scant teaspoon of Aleppo pepper stood in for piment d’Espelette. I used 7 jumbo eggs plus 4 extra large egg whites and cleared my fridge of odds and ends in the process. I had a serious case of pan envy when I was cooking the potatoes and onions in my young 10” cast iron skillet. So much of the potato starch stuck to the pan and all I could think was how to get my hands on a well-seasoned heirloom cast iron skillet. Sigh, it will be years before my pan ages gracefully to such non-stick state. Surprisingly, unmolding the tortilla was a breeze. Strange how things work sometimes. 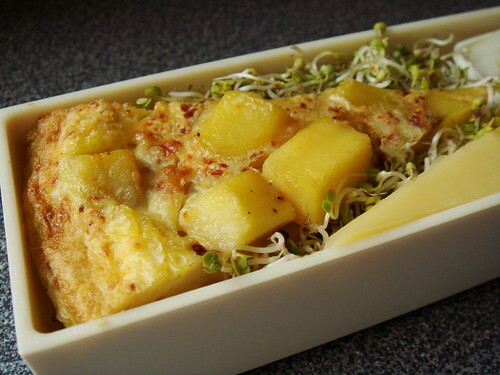 For my French-inspired bento, the Basque Potato Tortilla is obviously the focus. 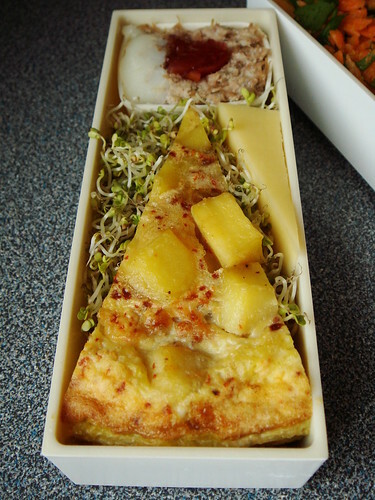 I nestled a slim slice on a bed of broccoli sprouts. 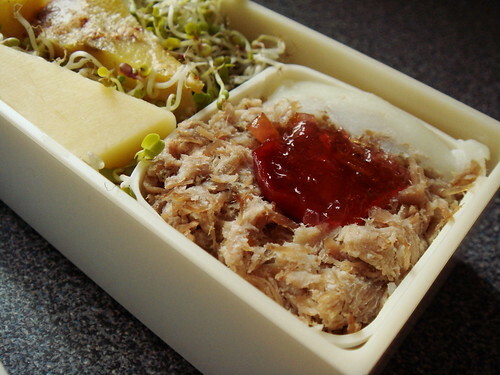 Next to that is a wedge of Comté cheese and a small container of pork rillette topped with a tiny dollop of Sour Cherry Meyer Lemon Marmalade. 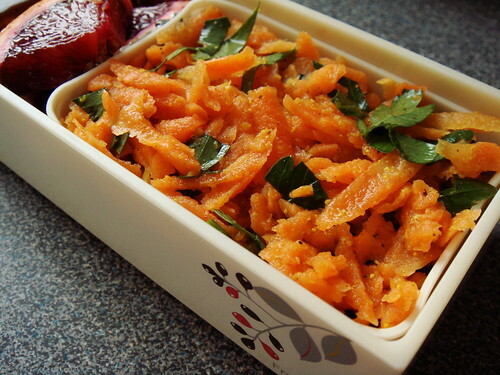 The top tier of my bento has a container of salade de carottes râpées that I made with grated carrots, chopped parsley, white wine vinegar, Dijon mustard, and Meyer lemon marmalade for a bit of sweetness. 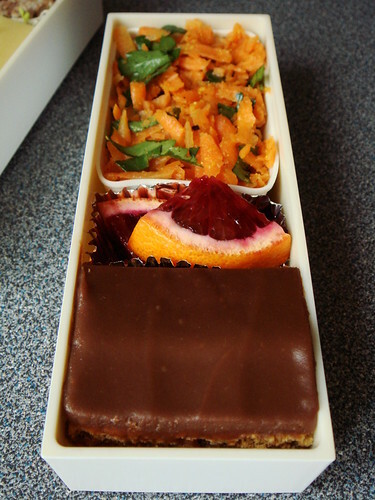 For dessert, I have wedges of blood orange and a piece of Nutella Pudding Icebox Cake (recipe will be revealed on World Nutella Day tomorrow!). This is a nicely balanced meal with appetizer, main course, palate cleanser, cheese, and dessert. I’ve taken a traditional Japanese concept yet the execution is French through and through. Okay, perhaps I’m missing a glass of white wine to be qualified as completely Gaelic but who’s keeping track? 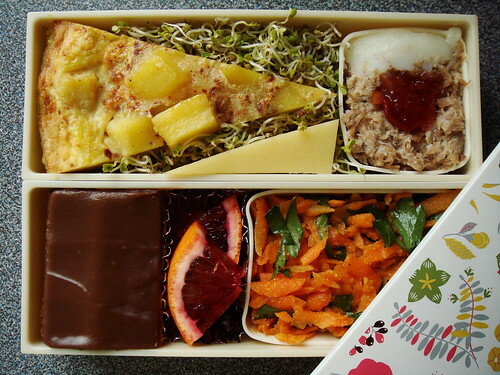 I think “Around My French Bento” has quite a nice ring to it, don’t you think? I can’t wait to see the work of other French Fridays members!